I’m combining posts today to squeeze them into this year and so I can post 2017’s goals tomorrow. Not that looking back at 2016’s goals is an official Top 5 post but I like to do it. I’m just going to put the headings here but you can read more about this year’s goals here if you like. I’ve definitely sewn more this year so we’ll count this one as a success. Other things have definitely been neglected though and I haven’t exercised as much as I’d like. I’m in awe of people who manage to fit everything in. It’s probably because I go to bed too early. 10 o’clock on the dot, I’m in bed. Big time no. I failed this one so dismally. I kept track in a spreadsheet and I bought 87 metres of fabric this year and used 60 metres of fabric so I’ve increased the stash by 27 metres when I really need to be decreasing it. My sewing room is very small and I don’t have the storage space for such a huge stash. Plus what good is it doing sitting in boxes? Yes! I’ve managed this one. I went to a real life meet-up! In Cambridge no less, which is about 250 miles away from where I live. 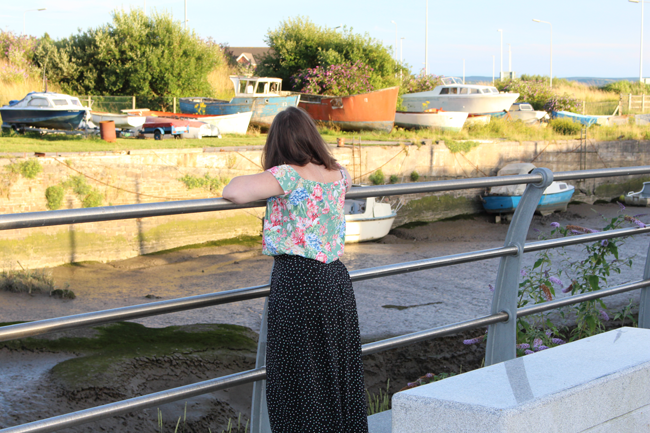 I’ve taken part in photo challenges and tried to comment on blogs more but I can still do better with that. Making my YouTube channel more active this year has definitely led to more interaction with other sewing peeps, which has been really lovely. More of that in 2017! Time for the navel gazing! This is a big one. The advice on patterns is always to choose the bigger size if you’re in between sizes but I’ve started to notice that that leads to things being a little bit too big. I guess I’m used to wearing RTW with less ease built in? Who knows. Something to bear in mind when choosing pattern sizes next year. Nothing earth shattering here but I did quite a bit of sewing with a TV show on the laptop or iPad this year and I quite enjoyed it. I don’t think it’ll replace the radio or podcasts for me but it made a nice change. I watched most of iZombie while sewing, the new Gilmore Girls episodes (still have the last one to go though) and Home Alone while making Christmas presents. I’m open to suggestions for things that are good but don’t need full attention. I mainly like silly things. I was thinking maybe Love, or Orphan Black but I don’t know if they need to be properly watched. Whenever I take the time to cut out a couple of projects in advance I always feel like I whizz through the sewing and feel so productive. Especially if they’re things that I can use the same colour thread for. I’ve got two projects using the same mustard jersey cut out waiting to be sewn up. And I’ve still got just under two metres of it left so I’m hoping to get another cardigan and maybe a tee cut out and then I’ll have a mammoth mustard sewing session in the new year. I’m a bugger for comparing myself to other people and finding myself lacking. Whether it’s their productivity, fitting or just general skills. And I need to cut it out. We’re all on our own journey and other people being faster or better at sewing than me doesn’t affect my sewing in the slightest. 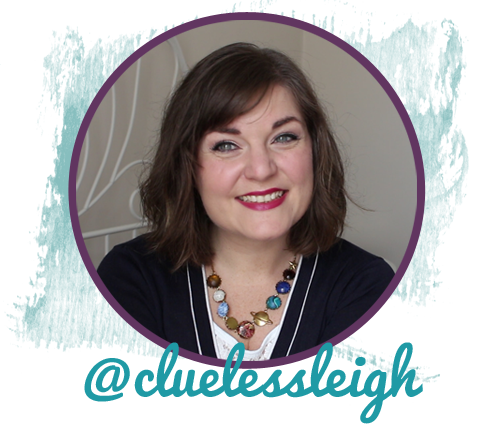 I’m just going for it with the twee expressions this year. Basically what I mean is that waiting to be “good enough” to use the good fabric is dumb. *Glances at the sloth and dinosaur fabric* And so is obsessing over crotch wrinkles that you wouldn’t give a second thought to in RTW jeans. *Pointed look to the Gingers that have been on hold since March* Having something finished is better than having fabric sitting in a drawer bringing no one any joy. So those are the some of the things I’ve learned in 2016, as well as specific fitting issues I’ve started to work out – basically I have terrible posture and need to do more yoga or pilates in 2017. Hope you all have a lovely New Year’s Eve, thank you all for the support and kind words in 2016 and I’ll see you again in 2017. 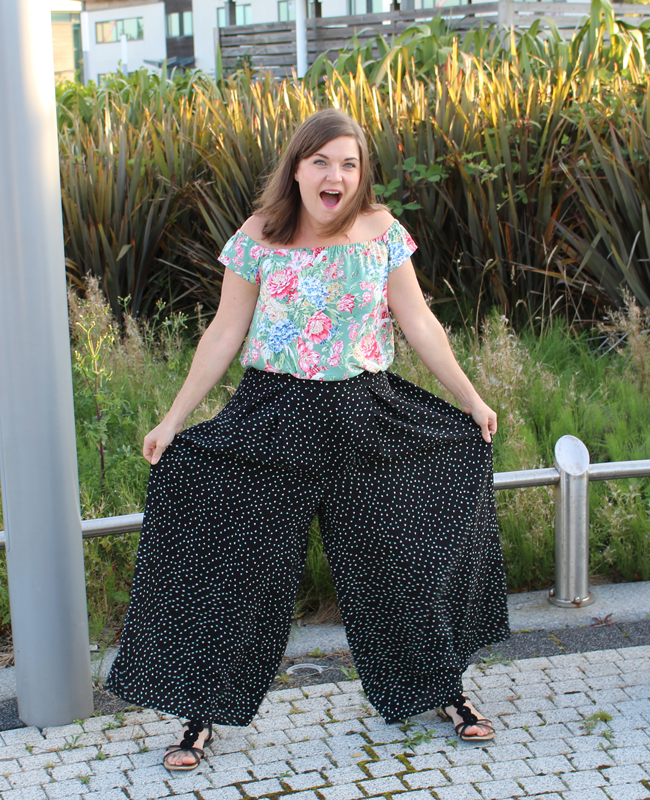 As soon as I saw Helen start posting samples of the different versions of her Winslow Culottes I knew I wanted them. I even nearly signed up to pattern test them, which isn’t something I normally do as I don’t sew quick enough and I don’t know that I’d be that good at giving useful feedback. It was view D, the maxi version that stole my heart though. 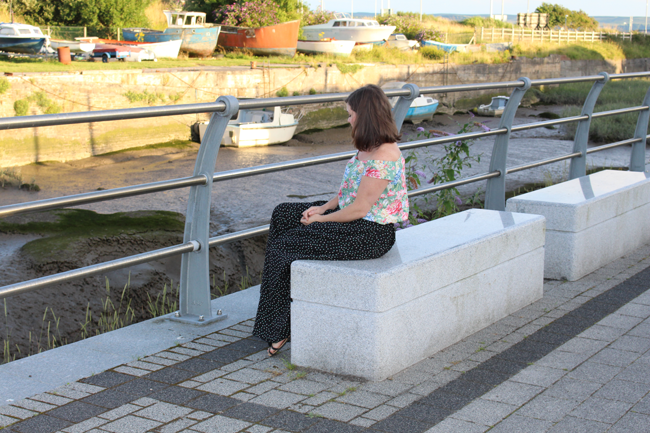 It was a lovely evening last night so I grabbed the manfriend and my camera and we went for a blog photo taking stroll. 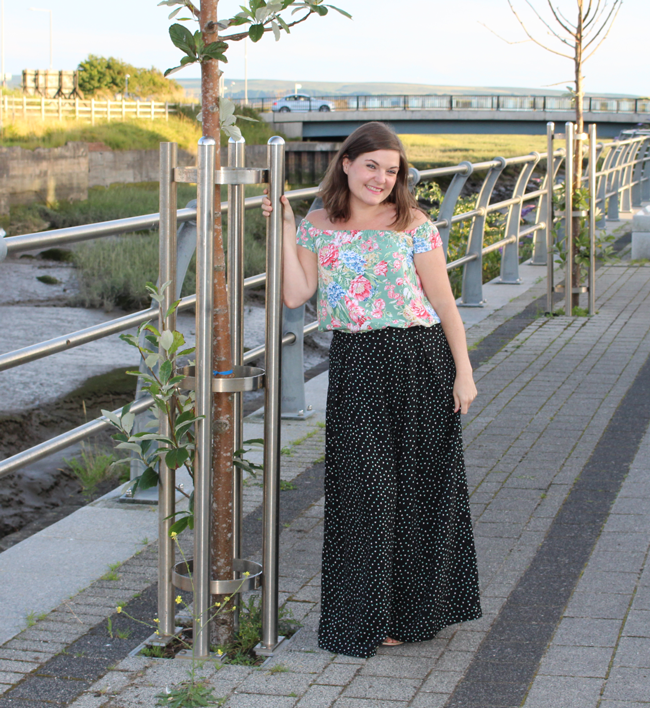 I’ve professed my love for maxi skirts and dresses every time I sew one and what appealed to me so much about the Winslow culottes is that you get the look of a skirt (in my case maxi) but the comfort of trousers. Be gone evil Summer inner thigh chub rub! The culottes sit on your natural waist with a straight waistband, have two box pleats front and back and side seam pockets. I left the pockets off because I don’t like them so this was a super quick sew, even for a slowcoach like me. It’s a PDF pattern and a maxi pattern usually takes a lot of paper and assembling but something I really liked about this pattern is that Helen gives you instructions for what pages to print for different views. Because they have a straight leg you can print view B and then just draw straight down on your fabric for how long you want your culottes. I still managed to make mine too long and had to cut 4″ off before hemming. I think it’s because the crotch hangs slightly too low on me. It’s not noticeable to anyone but me and I don’t think you want the crotch seam all up in your business in a style like this but I will shorten the depth before my next version. I should have thought about it beforehand as I am petite. The fabric I used was a bargain from The Textile Centre at £3.99/metre. It’s viscose but slightly heavier weight than most of the viscose I’ve used before, which I think worked well for this pattern. They’re still nicely swishy but I feel safe from my knickers showing through. Here’s a close-up of the print, it’s teeny mint green and white hearts. I’m also pretty pleased with my invisible zip insertion. I bought 3 metres of it and I think I have enough left for a top. Speaking of tops, the one I’m wearing in these photos is also a Me Made, which was fresh off the sewing machine before we went out. It’s a wearable toile of an off the shoulder Grainline Scout tee hack. I really like it but it’s not quite right and I’ll need to tweak it a bit before using my proper fabric. This fabric might look familiar as it was leftover from my By Hand London Flora. All I did was cut off the top of the sleeve and bodice pieces just above the notches then added 7/8″ seam allowance to allow for pressing under 1/4″ and then 5/8″ to make a channel for my 1/2″ elastic. Hope that makes sense. I can attempt to make a tutorial as I make my proper version if anyone would like me to? I don’t think I really have that much more to say but I had a surprising amount of photos I liked from this photo shoot so I’m going to carry on bombarding you with them sorry. I wore these to work the day I finished them (I sewed the hem that morning) and I got a lot of compliments. One work friend got really enthusiastic thinking up different length and fabric combinations so I told her that she really should start sewing. 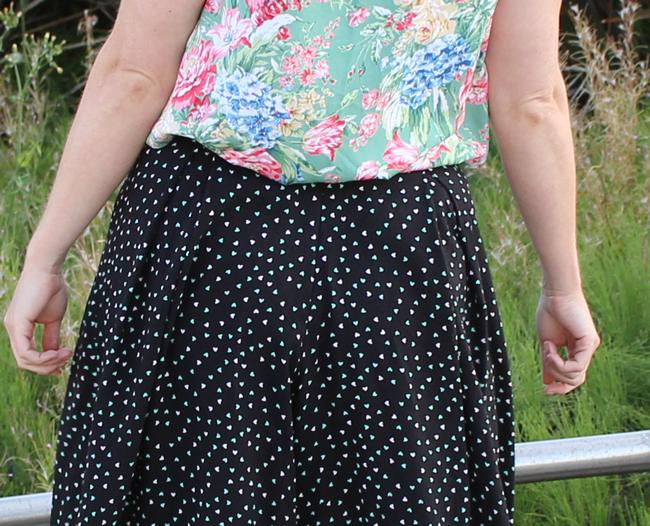 I definitely want to try the knee length myself but as I have lots of summer sewing already planned they might have to be an autumnal pair in a heavier fabric. Oh I there was something else I wanted to say. Can anyone recommend some good quality fusible interfacing I can buy online please? The stuff I have is a bit pants and doesn’t adhere very well. Oh yes, definitely. I really want to try a shorter version but I’d love more long ones too. So many things to sew, so little time! I’ll shorten the crotch depth by about 2″. I may also contour the waistband slightly as I don’t like the way straight waistbands sit on me. I did think about attempting to put front pockets on them too. 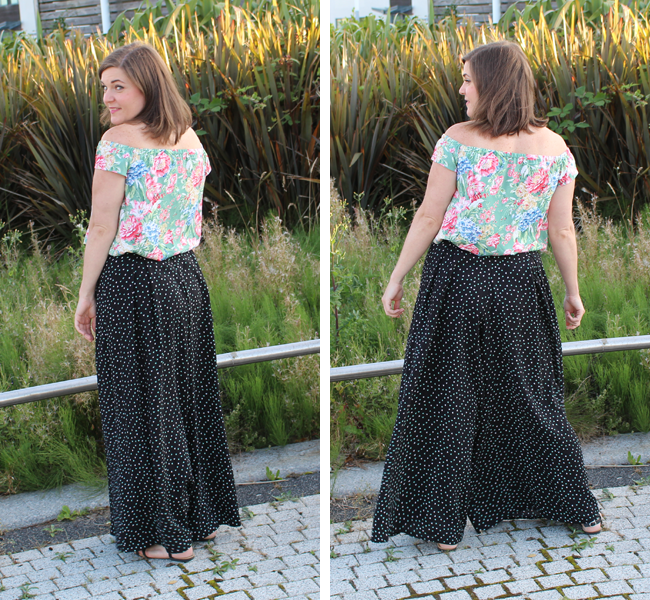 Probably using the Sew Over It Carrie trousers as a guide. Not that I ever use pockets for anything other than my hands. Helen’s round-up of tester versions has all of the pairs I was going to link to here so you should check that out to see more versions. 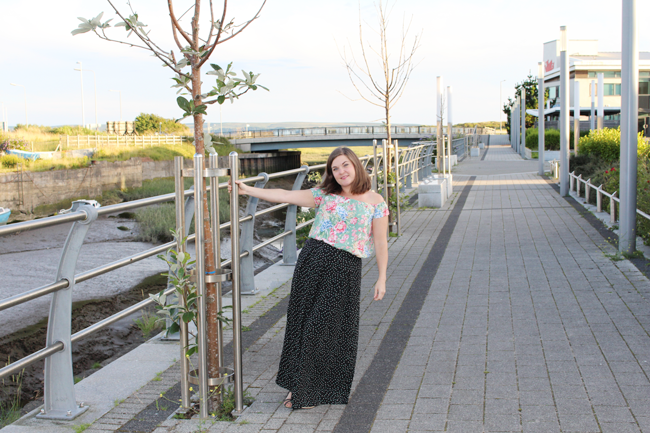 I love these culottes/palazzo pants. They’re comfortable but I still feel sort of elegant and put together in them. Hope you’re all having a great weekend. 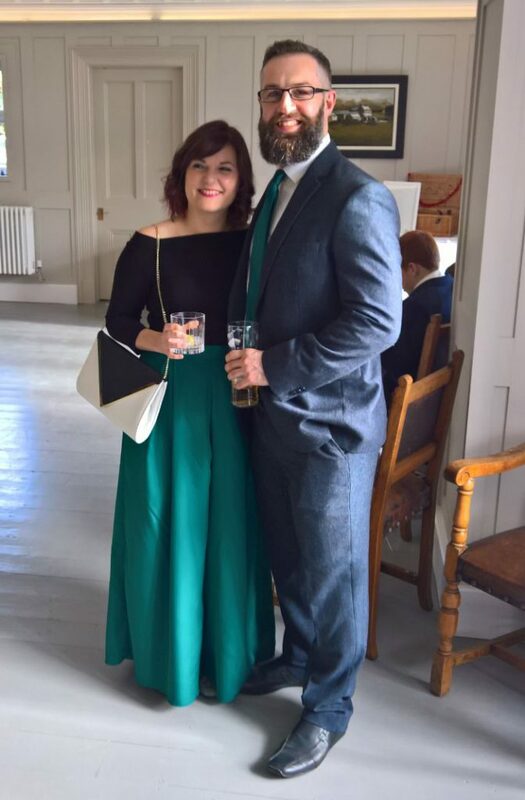 Yesterday I recklessly agreed to make my mum a dress to wear to a wedding in a couple of weeks. So I’m off to her house in a little bit to take her measurements and look at fabric online. I’m a bit anxious about it as the pattern we’re thinking about is quite fitted. Though I suppose fitting someone else is easier than fitting yourself.